*WHITE PLAINS, N.Y., March, 16, 2010 - *The USTA announced today a joint venture with Tennis Skillastics to further combat childhood obesity and re-energize physical education in schools. Tennis Skillastics was debuted at the AAHPERD (American Alliance for Health, Physical Education, Recreation and Dance) Convention in Indianapolis. Tennis Skillastics is the most recent addition to the USTA’s Youth Initiative, which includes the QuickStart Tennis play format, Jr. 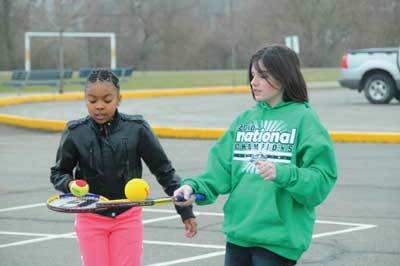 Team Tennis, No-Cut School Teams, and the Tennis On Campus program. The latest offering from Skillastics®, Inc., Tennis Skillastics produces popular fitness and sport-specific activities and games for varying ages and skill levels that are marketed worldwide to schools, youth service organizations and recreational agencies. “The innovative Skillastics® format is ideal for introducing tennis skills to large groups of children without the need for tennis courts. Through an exciting mix of tennis/fitness activities, children of all abilities will be able to develop skills quickly, gain confidence and acquire a love of the game that can last a lifetime,” said Jason Jamison, National Manager, School Tennis, USTA. Developed to keep kids active and expose them to the game of tennis at an early age, Tennis Skillastics is designed to be played with QuickStart Tennis equipment, which scales down the game to better fit the needs of young children by utilizing smaller balls, racquets and courts. Since the inception of Skillastics® in 2003, more than 13,000 schools and youth service organizations have used Skillastics® activity games, and continue to praise its ability to provide effective standards-based educational principals all in the atmosphere of FUN!